Surflog for ConnectWise Automate Adds New Charting with DevExpress. 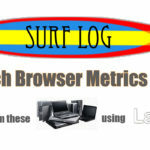 Plugins4Automate has updated SurfLog Browser Metrics Plugin for ConnectWise Automate today bringing in new charts and graphs that use the DevExpress libraries. This allows the plugin to work as designed in the new Automate 12 versions. We look forward to seeing all the other integrations Plugins4Automate has available using these new UI libraries.